As most virtualization.info readers and VMware customers know, VMware currently has two CTOs: Stephen Herrod, one of the very first engineering directors that joined the company in its early days (Herrod also is the Senior Vice President of R&D) and Scott Davis, co-founder and former President and CTO at Virtual Iron, who was promoted CTO of the Desktop Virtualization business unit at VMware in September 2009. 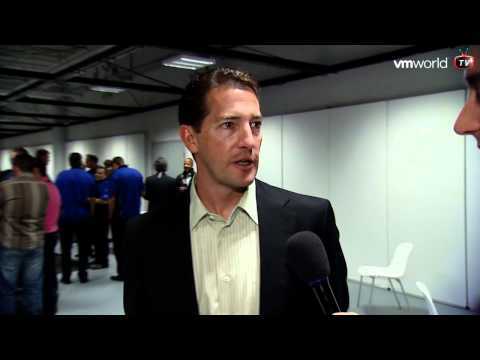 During the summer VMware appointed a third one, Paul Strong, as confirmed by Herrod in a video interview recorded earlier this week at the VMworld Europe 2010 conference in Copenhagen (read virtualization.info live coverage here). Strong, appointed as CTO of the EMEA region (can we expect an APAC CTO too?) in August, comes from eBay, where he has been a Distinguished Research Scientist for almost five years. He was responsible for research into Enterprise Grid Computing, driving eBay’s long term Enterprise Grid strategy/vision. At the same time, Strong has been involved in the Open Grid Forum activity as Chairman first and then Secretary of the board of directors for almost three years. Strong’s expertise suggests a VMware future expansion in grid computing: he is an expert in the modeling, architecting, design and management of complex distributed systems. It’s also hard to see Strong’s role limited to a European activity over the long term. Update: As our readers correctly pointed out, VMware actually has four CTOs. The forth one, not mentioned in the article above, is Javier Soltero, the former CEO and co-founder of Hyperic, who arrived at VMware through the SpringSource acquisition. Soldero, named CTO of SaaS and Application Services in the Cloud Services business unit, founded Hyperic in March 2004. Before that he was the Chief Architect at Covalent Technologies for almost three years.